Heat oven to 450°F. Spray 8-inch square (2-quart) baking dish with cooking spray. Cook and drain pasta as directed on package. Meanwhile, in large bowl, toss bell peppers, mushrooms, zucchini, oil, Italian seasoning and salt to coat. Spoon into ungreased 15x10x1-inch pan. Bake uncovered about 20 minutes or until crisp-tender. Cool slightly. Coarsely chop vegetables. Reduce oven temperature to 350°F. In 4-quart saucepan, mix sauce mix (dry) and milk. Heat to boiling over medium heat, stirring constantly; remove from heat. Stir in cheeses until melted. Stir in pasta until well coated. Spoon half of pasta mixture into baking dish. Reserve about 1/2 cup of the vegetables. Spoon remaining vegetables evenly over pasta. Top with remaining pasta. Sprinkle with reserved vegetables. Cover with foil; bake 30 minutes. Uncover; bake 10 to 15 minutes longer or until bubbly. 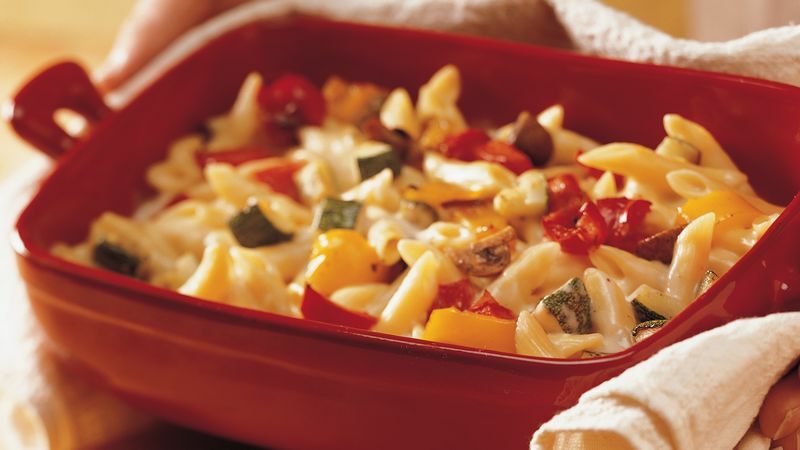 Prepare this meatless casserole and refrigerate up to 24 hours ahead of time. Bake as directed. Serve with a packaged ready-to-eat Caesar salad from the produce section.